The equipment will conduct a dynamic simulation of the equipment under rain environment with various intensities, to evaluate the work performance of the products. The equipment uses the high-pressure water pump to spray the test water with certain pressure and certain amount of flow on test samples via a swing stem nozzle. The environment required by the test is reached by rotating the test device and changing the range of oscillation and frequency of the swing stem. ◆The housing is made of cold-rolled steel plate with plastic spraying/ the inner wall of the work chamber is processed and formed by SUS304 stainless steel plate. ◆Stainless steel fin electric heater. ◆Special electric motor, centrifugal convection fan. ◆The imported PT-100 sensor is used for the temperature measurement. ◆Silicon rubber sealing strip, imported waterproof sealing rotating joint. ◆“TIANMUHU” flow control valve, “HUAFENG” adjustable-speed motor. ◆Sample holder and the rotational structure of the sample holder, glass observation window. ◆Rotation angle, frequency photovoltaic conversion control system. ◆The case of the test chamber is of overall structure, the rain water tank, high pressure water pump, rotary system of the testing apparatus are on the lower rear part of the case, and the control system is right below the test chamber. ◆The test chamber is of single door, which adopts sealing by double-layer ageing resistant silicon rubber. ◆There is an observation window on the chamber door. ◆An illuminating lamp that can be controlled by the switch is installed on the equipment. 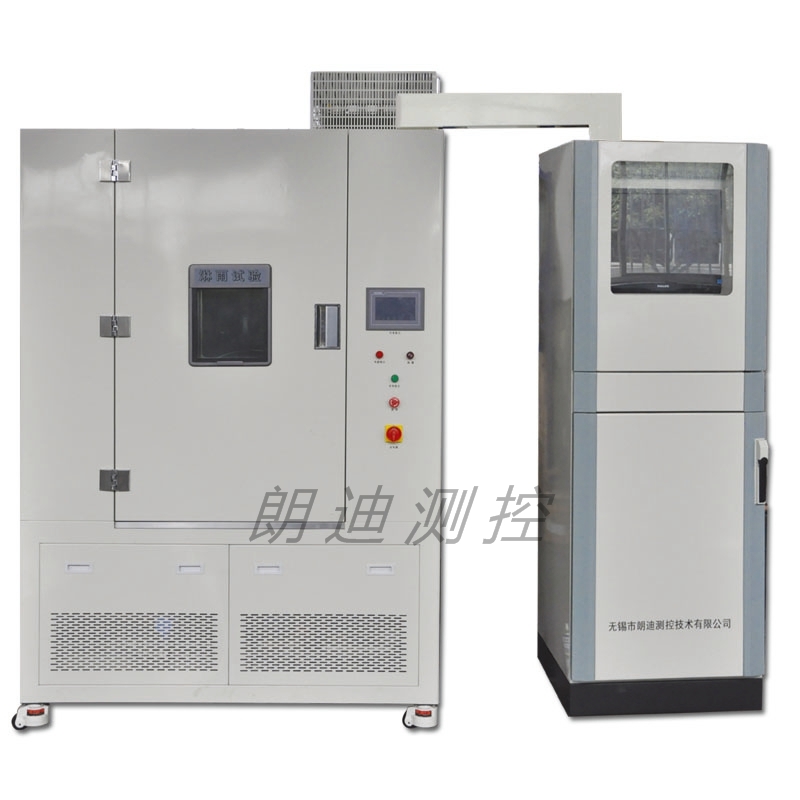 ◆Water-proof rotary joint and photoelectric conversion system are installed on the right of the test chamber. The radius of high-quality stainless steel spray water pipe is 800mm, and the inner diameter is 16mm.